Today, I'm going to show you how to make an easy, no fuss, (almost) no knead sourdough that'll knock your socks off. 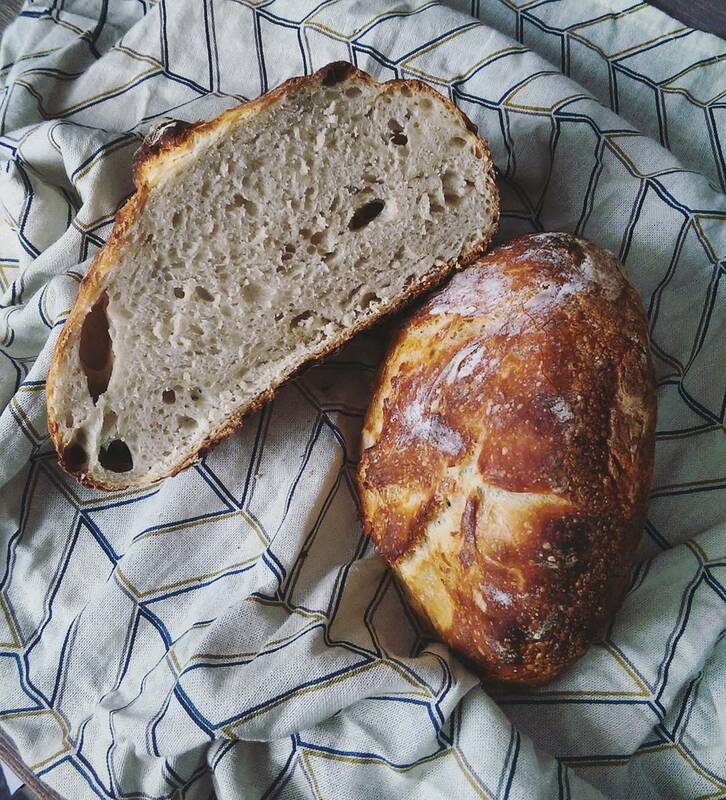 A few weeks ago, I decided to embark on a quest to make my own sourdough bread. 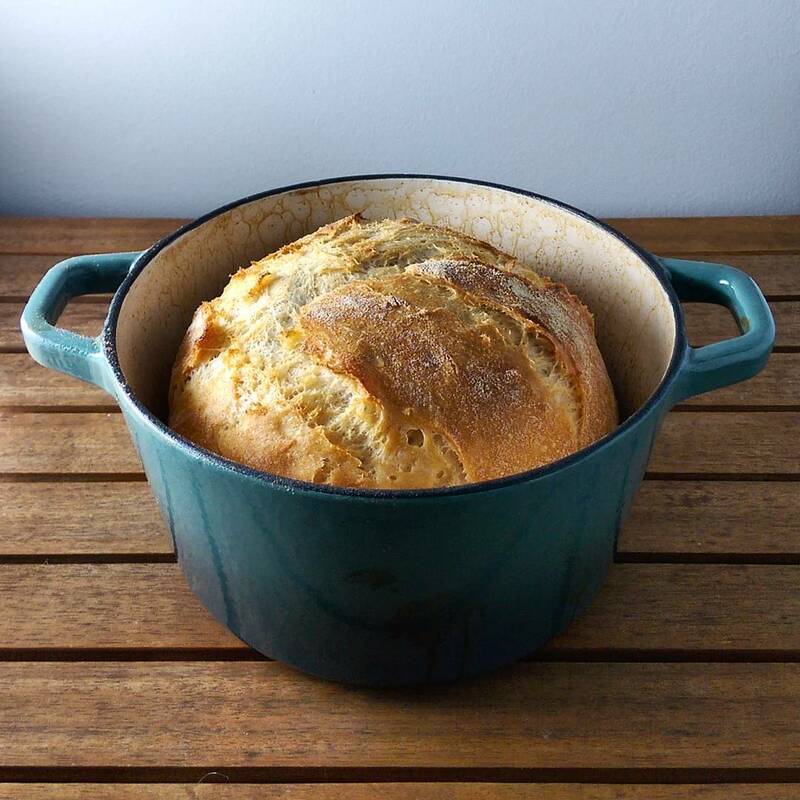 Inspired by Michael Pollan's latest book (a MUST-read for food lovers) Bread - something that was once undeniably basic - has become incredibly artisanal in the past few years, and there is a reason why - it truly is an art. There is a certain pride in cooking from scratch, even more so when you've cultivated your own ingredients. 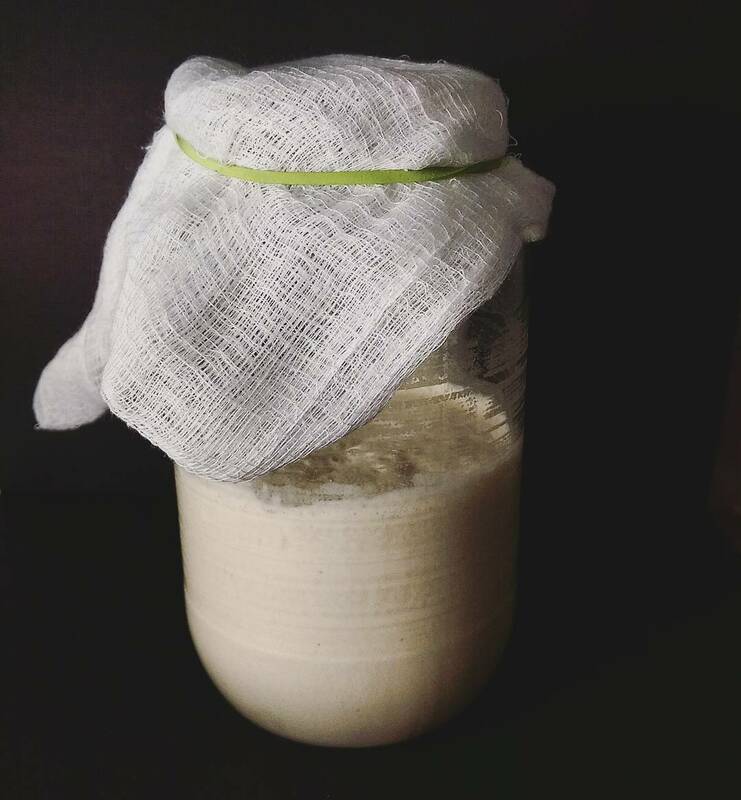 While I don't have the means to grow and mill my own wheat, I've done the next best thing: cultivated wild yeast. 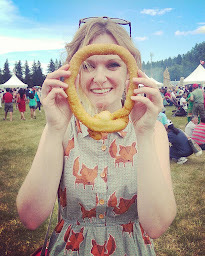 Fermenting foods is not new to me. I had a brief love-hate relationship with a Kombucha scoby a few years back, and I've brewed my own ale & lemon wine (though, the latter may have had a taste similar to prison hooch.) This sourdough starter method is a piece of cake -- err, bread -- compared to all of that. This magical starter is comprised of three ingredients: flour, water, and time. Time is possibly the most crucial of all when making your actual bread. I do admit, I had three failed attempts before I finally found success. The problem? My starter was much too young. Many websites and blogs will tell you that 5 days is enough to get it well and going. 5 days is a gigantic lie. 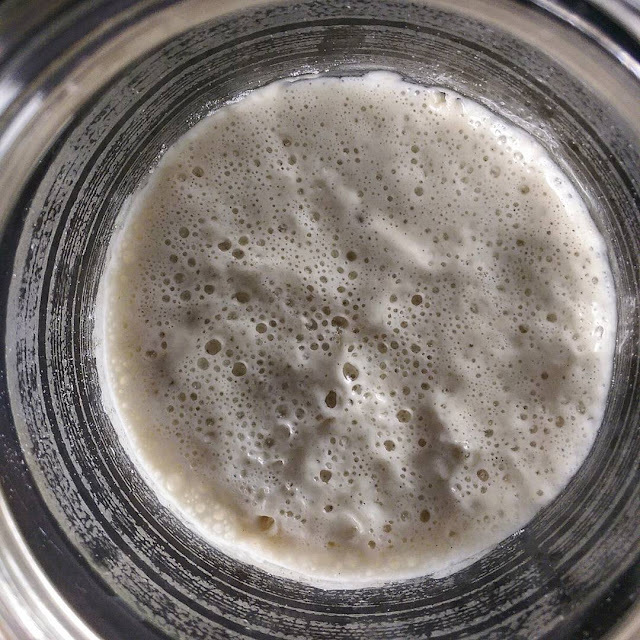 Maybe if you're using magical flour and you live in San Francisco that'll work for you, but in my reality, my starter needed a good three weeks before it was ready to produce it's first loaf. You can do this with any type of flour (rye has been highly recommended to me) but I decided to use regular ol' AP white flour. It's what I have an abundance of, and it's relatively cheap, so if this experiment failed, at least I wouldn't have spent too much on it. Place 50g flour and 50g water in your dish. Gently stir until well combined. Cover with cheesecloth and let sit for 24 hours. The next day, add another 50g flour and 50g water. Stir again. Wait another 24 hours, repeat, repeat, repeat. You will do this for 3 full weeks, leaving your jar in the same place, at room temperature. Your starter will begin to get bubbly and active around day 3 (see photo just below) and start smelling slightly sour around day 5. This is good! Keep going! Check for signs of mould (pink, green or black). Any signs of mould and you must throw your starter away and begin again. If your starter is becoming too big for your bowl or jar, discard all but 100g, and continue feeding daily. You'll keep your starter in the fridge while she's not in use. Feed her about once a week (mark it on your calendar to remind yourself!) If you don't end up using her for a while, give some away to friends and family so that they can partake in this sourdough magic themselves! When you're ready to bake, make sure to take your starter out and feed it about 8 hours before you mix your dough. You'll find a lot of articles and websites telling you that you have to make a starter, take it's temperature, make a levain, then an autolyse... the whole process might seem a bit daunting, or even very intimidating. This is the most basic, no-knead, long-rise method that works for me every single time. I am no expert in sourdough, but I know what works, and I know what tastes good, and this, my friends, is it. The word "basic" may be in the title, but this loaf is anything but. It's complex flavour and aroma will take your sandwich game to the next level. TIMING IS IMPORTANT! This dough takes 12 hours to rise, and then another 2 hours after the punch down before baking. That means that it will only go into the oven 14 hours after you mix it together. I like to make it right before bed, and bake it in the morning. Alternatively, if you're an early riser, make the dough in the morning and bake it in the late evening. Combine the starter and the water in a large glass or ceramic bowl. Mix until mostly dissolved. Add half the flour and mix with a bench scraper, spatula, or your hands. Add the other half of the flour and the salt. Mix together until fully combined. Make a ball with the dough, cover bowl with plastic wrap and leave in a warm (room temperature) place for 12 hours. Notes: your dough will be a bit sticky, and quite shaggy in texture. This is normal. If it is too dry and not holding together, add a tbsp or two of water at a time until it's all together. Do not add too much water. The dough will soften overnight! 12 Hours Later: flour a work surface and your hands, and scrape the dough out of the bowl onto it. Make a smooth ball by pulling/stretching (not kneading) the dough, as if you were folding it onto itself. Don't play with it too much as it will start to stick to your hands. Flour a tea towel. Place dough ball on tea towel, sprinkle with more flour. Use towel to cover the dough. Place in a clean bowl and let rise another 2 hours. 1 1/2 hours later: Place your dutch oven in your cold oven. Heat to 450F. Allow dutch oven to warm up along with your oven and let it stay in there about 30 minutes. Gently turn dough out into the hot pan. Use a sharp knife to cut three slits on top. Cover and return to oven for 25 minutes. Uncover and continue cooking another 30 minutes, or until top is dark and gold. Remove, cool for about 15 minutes in the pot, then turn out onto a cooling rack. Exercise self-control: do not slice until bread has cooled!